Bolognia right in the middle of the Lions' best season in years. Eisenhower improved with 12-0 with a 7-0 win over Catholic Memorial on Nov. 3 and advanced to the Level 4 playoffs on Nov. 10, playing Whitefish Bay at Kettle Moraine. In the win over CMH, Belongia opened a scoreless second half with a 70 yard kick-off return and then scored the game's only touchdown on a 2-yard run two plays later for the win. Belongia has played on teams with his current teammates since he was with the New Berlin Generals in third grade. said before the win over CMH. "We haven't won a Level 2 playoff game since 2002. We haven't been a level 3 team since 2002.
go all the way. It's been a dream and we want it to be a reality." One win over the North Shore co-champion Blue Dukes (11-1) on Nov. 10 and that dream can become a reality. Photo by Tom "Sky" Skibosh --- New Berlin Eisenhower senior Jake Belongia leads the Lions in scoring with 20 touchdowns so far this season. Belongia has been a big part of the Lions' success, splitting his time between running back and outside linebacker. Coach Matt Kern talked about Jake's strengths at running back and outside linebacker. "Speed is definitely one of them; how hard he runs," he said. "You hear it from everyone who watches our games. He runs with a certain intensity. He runs through arm tackles; he's a tough, tough kid. "On defense he has great leverage. He's a really good natural tackler. He has that speed to chase down from the edge. He's good in coverage. He really understands our defense and he plays it smartly. He combines all those things to become a very good defensive player." Belongia is second in rushing with 877 yards in 111 carries, an average of 7.9 yards per carry with 13 touchdowns. He is also a threat through the air, catching 26 balls for 306 yards and 7 touchdowns, an average of 11.8 yards per carry. His combined 20 touchdowns leads the Lions. "My strength is running low to the ground," he said. "If you run higher, you can easily be tackled. But me and Jack Himmelspach (his running mate) do a great job at staying low to the ground, making hard cuts and just running straight downhill. But Jake, who is a solid 5-feet, 9 inch, 185 pounds, is also proud of his defense. "I'm good at holding the edge and that's my job," he said. "I keep that outside arm free. I take on blocks really hard and I don't let them affect me. I try to hit back when I see a big lineman coming at me. I try to hit him first." Belongia wants to play football at the next level, so he knows he has things to work on. "When I see a hole I should get more cutbacks," he said. "I've been running to the outside. I put my head down and get as many yards as I can so I don't lose yardage. 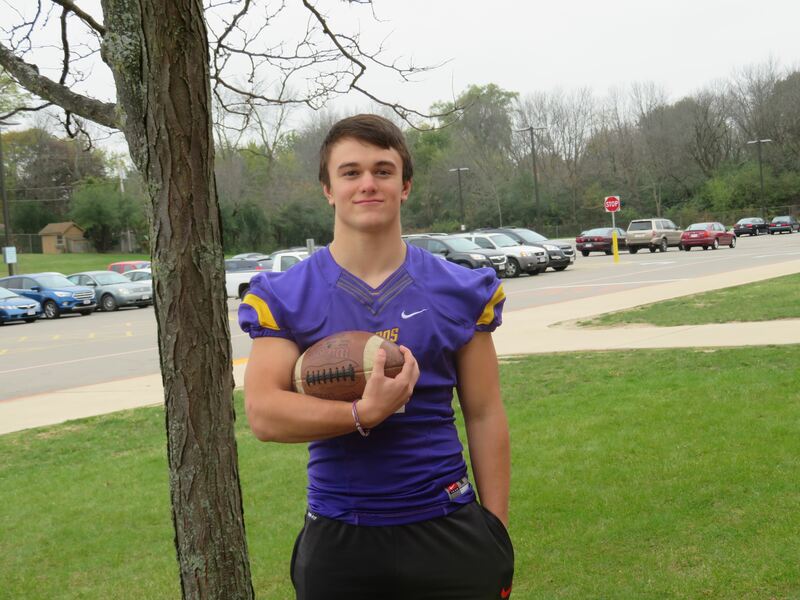 "As an outside linebacker, I want to work on pursuing to the ball when someone pops me. I want to make the tackle also." Photo by Tom "Sky" Skibosh --- One of five captains on this year's team, senior Jake Belongia has been New Berlin Eisenhower's vocal leaders this season. Belongia then showed why he is such a team guy. "I love blocking, even though it's underestimated," he said. 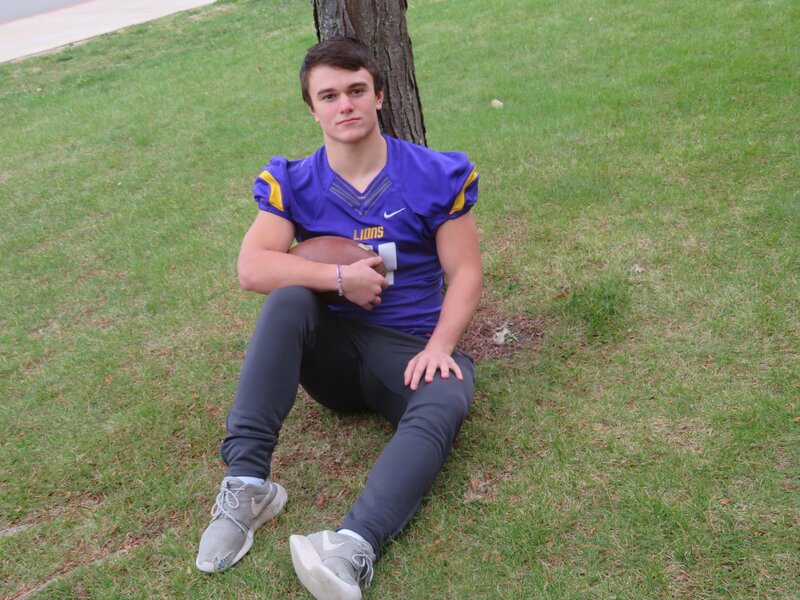 "I love when Jack (Himmelspach) gets the ball, running down the field and blocking for those guys so they can get yards and score touchdowns." When asked why he stuck with football, Jake, who also went to state in wrestling and track and field, had a simple answer. to fall back on. I think it's the best sport on this earth and I love playing it." Jake then pointed out how the teamwork applies on defense. outside arm free. Middle linebackers have to rely on me - if there's a breech on the outside that's on me. And it's on them to fill the hole when I hold the edge. They have to come up and tackle the running back. I count on them as they count on me. There's a lot of teamwork involved." Belongia then talked about ups-and-downs of playing both ways. "There is a little more pressure on me, but I love it, though," he said. "I want to be on the field every second of every single game no matter what. I love to make plays and just be on that field. conditioned. But now with these later games, I feel I can be out there more, I don't get as tired. I can keep up with it." Abbott. Leadership is important to him. can come up and make an impact on our team. definitely don't want to just tell them, I want to show them. If they do something wrong in practice I'm going to show them what to do." Kern has seen Belongia grow as a leader over the years. the locker room. Guys have a lot of respect when he has something to say." When asked to sum up his career, Kern added the following statement. MOST MEMORABLE MOMENT: Winning Conference this year and reaching Level 3.